Windows 8 was released today on MSDN and Technet. It will soon be released publically. With that comes the many GBs of downloads for the ISOs. Many may have newer Ultrabooks, which do not feature DVD drives anymore. Rather than burning the ISO to a DVD disc, why not put it on a bootable USB stick? There are many ways to do this, and I have found that the best way to do this is to use a command tool called DISKPART. The commands are fairly easy. Open an elevated Command Prompt and type DISKPART. You will open up the Diskpart tool, as evidenced by the DISKPART> prompt. DISKPART>LIST DISK <- This will give you a listing of the disks on your system. It is very important to identify the USB disk, as you really do not want to format your system drive. DISKPART>SELECT PARTITION 1 <- Since there is only one partition, this will select it. Once the USB drive has been prepared, you can now use a utility like 7-Zip to extract the ISO directly to the drive. BTW. This process will also work when creating bootable USB disks of other Windows ISOs – Windows Server 2012, Windows Small Business Server 2011, Windows Server 2008 R2, Windows 7, and even Vista. I recently resolved a problem which occured on just about every Laserjet P2035 printer when printing from Windows 7. When printing a page, ie. the test page, multiple copies keep printing until you cancel the print job. Updating the printer drivers have no effect. 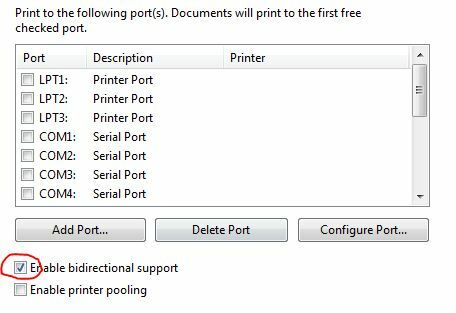 The fix was to untick the Enable Bidirectional Printing in the printer properties. This scenario has been coming up fairly often recently. A PC becomes infected by a Fake-AV software. MalwareBytes (www.malwarebytes.org) cleans up the infection. Suddenly, EXE files cannot run. Not even Regedit. There are a couple off good resources which help fix up the registry and restore the EXE file association back to normal. Download and unzip the reg files. Right Click on the Reg file and select Merge. Thanks and acknowledgements to Doug Knox and Ramesh Srinivasan. They have more file association fixes listed below. After using the very early Pending.XML file edit fix as described in my earlier blog the Windows 7 PC would be left in a torn state. This meant that Service Pack 1 could no longer be installed on this PC, and possibly other patches as well. There are two options for recovering from this. First, you could reimage or rebuild this PC. This is often not a solution, especially if there were vaarious bits of information that could not be easily reinstalled. Note: I have not been able to find a PC in a torn state in order to test out this fix myself. 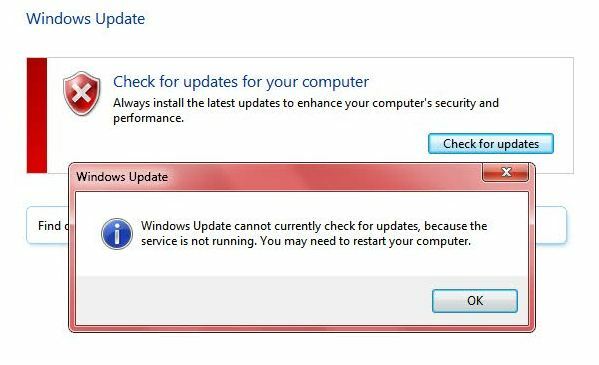 The recent SP1 for Windows 7 and Server 2008 R2 was pushed out via Microsofut Updates. There has been a plethora of posts from users stating that their installation has crashed their PC with the error above. A blog from joscon (Microsoft Support) suggests the following workaround/fix – http://blogs.technet.com/b/joscon/archive/2011/03/09/error-0xc0000034-during-service-pack-1-installations-for-windows-7-and-windows-2008-r2.aspx. This one is pretty self explanatory. Boot your machine into WinRE and pick a restore point before the service pack was installed. This should get you back up and running. [EDIT 15/3/2011] – Another suggestion from a MS Support Engineer via email was received. Boot from Windows Installation disc.